Senior of the Jews of Lithuania under King Sigismund I. of Poland; born at Brest-Litovsk about the middle of the fifteenth century; died there between 1530 and 1533. Michael, like his brothers Abraham and Isaac, was among the most prominent tax-collectors and lease-holders in Lithuania during the last quarter of the fifteenth and the first quarter of the sixteenth century. Exiled with the other Jews of Lithuania by Alexander Jagellon in 1495, he emigrated with his brothers to Poland. His brother Abraham embraced Christianity and soon returned to Lithuania; but Michael remained true to his religion, and did not again set foot in his native city until 1503, when permission to return was given to the expelled Jews. King Sigismund I., by a decree dated Wilna, Feb. 27, 1514, appointed Michael to the newly created seniorship over the Jews of Lithuania. In his capacity as senior he not only was to serve as mediator between the Jews and the king, but was also empowered to judge and to punish the Jews, in keeping with the rights granted to them, and to impose a fine or even a term of emprisonment on the guilty. Michael evinced his piety by attempting to force the Karaite Jews of Lithuania to conform to the doctrines of rabbinical law; but the Karaites, who possessed a charter of privileges granted them by Grand Duke Witold, refused to acknowledge Michael's authority, and the matter was decided in their favor by the king. This appointment, while it shows the favorable attitude of Sigismund toward his Jewish subjects, was actuated in the main by his desire to insure a thorough and prompt collection of the taxes imposed on the Jewish communities, and to reward the valuable services rendered to the crown by Michael and his brother Abraham. On the whole, however, the office of senior was honorary and nominal, since the concentration of the powers of the several communities in the hands of one person of the same religion was antagonistic to the traditions of the Lithuanian Jews. 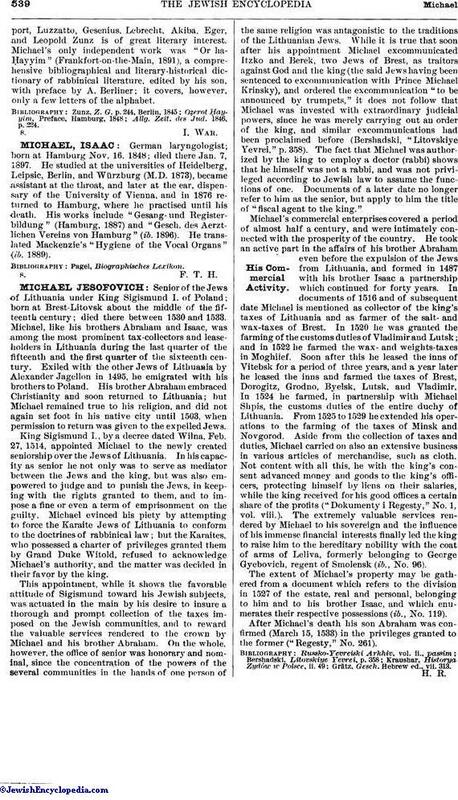 While it is true that soon after his appointment Michael excommunicated Itzko and Berek, two Jews of Brest, as traitors against God and the king (the said Jews having been sentenced to excommunication with Prince Michael Krinsky), and ordered the excommunication "to be announced by trumpets," it does not follow that Michael was invested with extraordinary judicial powers, since he was merely carrying out an order of the king, and similar excommunications had been proclaimed before (Bershadski, "Litovskiye Yevrei," p. 358). The fact that Michael was authorized by the king to employ a doctor (rabbi) shows that he himself was not a rabbi, and was not privileged according to Jewish law to assume the functions of one. Documents of a later date no longer refer to him as the senior, but apply to him the title of "fiscal agent to the king." Michael's commercial enterprises covered a period of almost half a century, and were intimately connected with the prosperity of the country. He took an active part in the affairs of his brother Abraham even before the expulsion of the Jews from Lithuania, and formed in 1487 with his brother Isaac a partnership which continued for forty years. In documents of 1516 and of subsequent date Michael is mentioned as collector of the king's taxes of Lithuania and as farmer of the salt- and wax-taxes of Brest. In 1520 he was granted the farming of the customs duties of Vladimir and Lutsk; and in 1522 he farmed the wax- and weights-taxes in Moghilef. Soon after this he leased the inns of Vitebsk for a period of three years, and a year later he leased the inns and farmed the taxes of Brest, Dorogitz, Grodno, Byelsk, Lutsk, and Vladimir. In 1524 he farmed, in partnership with Michael Shpis, the customs duties of the entire duchy of Lithuania. From 1525 to 1529 he extended his operations to the farming of the taxes of Minsk and Novgorod. Aside from the collection of taxes and duties, Michael carried on also an extensive business in various articles of merchandise, such as cloth. Not content with all this, he with the king's consent advanced money and goods to the king's officers, protecting himself by liens on their salaries, while the king received for his good offices a certain share of the profits ("Dokumenty i Regesty," No. 1, vol. viii.). The extremely valuable services rendered by Michael to his sovereign and the influence of his immense financial interests finally led the king to raise him to the hereditary nobility with the coat of arms of Leliva, formerly belonging to George Gyebovich, regent of Smolensk (ib., No. 96). The extent of Michael's property may be gathered from a document which refers to the division in 1527 of the estate, real and personal, belonging to him and to his brother Isaac, and which enumerates their respective possessions (ib., No. 119). After Michael's death his son Abraham was confirmed (March 15, 1533) in the privileges granted to the former ("Regesty," No. 261). Grätz, Gesch. Hebrew ed., vii. 313.